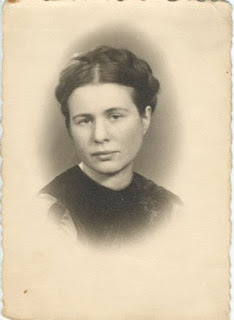 Irena Sendler was born in Warsaw, Poland in 1910. Her father, a doctor, died during a typhus epidemic in 1917. She attended Warsaw University, but was dismissed for failing to comply with Jewish segregation laws. When the Germans invaded Warsaw in 1939, Irena began helping Jews with food, shelter, and false documents. Her position as an administrator at the Warsaw Social Work Department allowed her to develop a network of 24 helpers who rescued children and found them hiding places in Polish homes, convents, and orphanages. In her role as a social worker, she was permitted to enter the Warsaw Ghetto. For a three month period in the summer of 1942, she worked to smuggle out children, including infants. When the underground group Zegota organized that fall, Irena headed the children’s division. She carefully documented the names of the hidden children in jars and buried them, so the children could be reunited with their true families after the war. They saved the lives of 2,500 children from the Holocaust. On October 20, 1943, the Gestapo captured Irena and placed her in Pawiak Prison, where she was questioned and tortured. Her legs and feet were broken and she was sentenced to death. Zegota bribed the executioner to help her escape, and she remained in hiding for the remaining years of the war. After World War II ended, Irena dug up the jars and began the job of trying to find a living parent for the hidden children. Almost all of the parents had died in Treblinka or another death camp. In 1965, Yad Vashem honored Irena as Righteous Among the Nations. 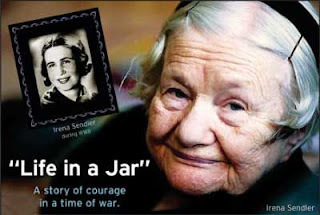 In 1999, four students in Kansas chose Irena Sendler as their National History Day Project, winning their State competition for Senior Group Performance for their ten-minute performance of Irena’s life titled, “Life in a Jar.” Their project inspired international interest in Irena’s role during World War II. When the girls discovered Irena still lived, they corresponded with her and later raised money to visit her in Poland. Irena received the 2003 Jan Karski award for Valor and Compassion and in 2007, she received a nomination for the 2007 Nobel Peace Prize. Irena Sendler passed away on May 12, 2008, in Warsaw, Poland. This woman is endlessly fascinating to me. I pray that I would be as courageous and selfless as Irena Sendler was during one of the darkest times in history. Thanks, Lisa, for making me stop and remember her today and thank God for her and those like her. I loved this story and watched the Hallmark movie about Irene Sedler this past Spring. Before I watched the movie, I googled her name to read her story; I wanted to know if the movie was going to portray her life fairly close to the truth and it appeared to do so. The story of how she came to be known to the world through a school project is fascinating. She led a remarkable, selfless life.